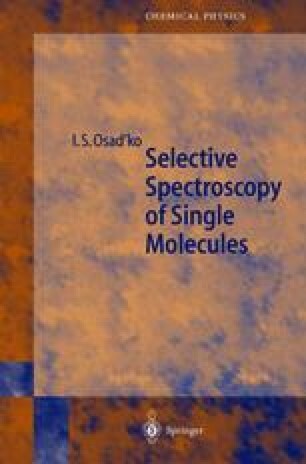 Although single-molecule spectroscopy is a very promising method, it is not accessible to all experimental groups. Most laboratories working in the field of solid spectroscopy deal with guest molecule ensembles in crystalline or amorphous solids. Amorphous solids like polymers and glasses are convenient solvents for many guest molecules. However, optical bands in amorphous solids have large inhomogeneous broadening. Laser excitation of the molecular ensemble enables one to remove inhomogeneous broadening and to make the first step towards single-molecule spectroscopy. Progress in the field of selective spectroscopy is discussed in this and the next chapter.